I am going to start off by saying I haven't been this "surprised" by a nail polish in a looong time. By surprise, I mean, I sort of picked this polish up on a whim and I will be forever happy that I did. 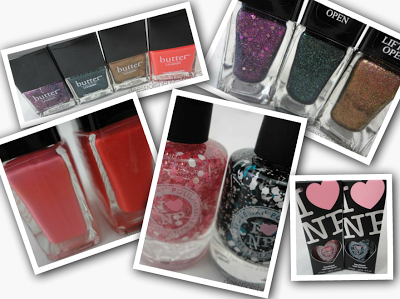 I am talking about Nails Inc. Baker Street. Now, I know I should have picked it up when it was first released.. I mean, it is called Baker Street, and I have been obsessed with Sherlock Holmes since we started watching 'The Great Mouse Detective' as children. Then the newer films, and the television shows - it is basically heavenly to me. Annnyways.. I never thought much of it despite how in love with it people were. 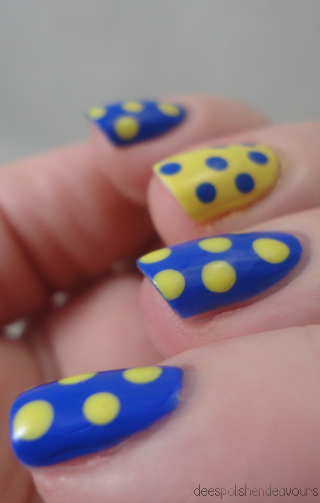 I was like 'I love blue nail polish, but, meh, I am sure I will survive without it.' Wrong. Maybe these photos won't do it justice.. I'm not sure, but it still looks magical to me. I had planned to alternate every finger (blue, yellow, blue, etc) but as soon as the first dollop of blue polish hit my pinky.. It was love at first paint. This blue is PERFECTION. I could have easily just used one coat, but you all know me and my being freaked out of one coat opaque polish! 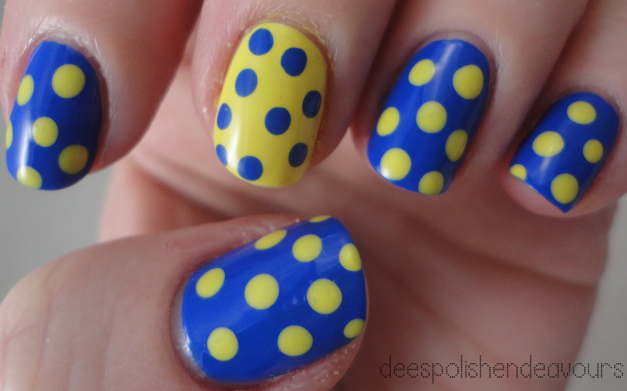 Looking at these photos makes me want to adorn my nails with this combo again!! And, I received a plethora (seriously) of compliments on this pairing. Particularly from guys. Kind of rad. I did this using Nails Inc. Baker Street (I picked up from Sephora), and Orly Spark, and the dots done with my dotting tools. I do apologize about my dry hands and cuticles. I am fighting an always losing battle. I don't know what to do about it all. I apply lotions all throughout the day, cuticle oil, cream, butter, etc, I wear gloves at night, and I am still left with this. I drink a wealth of H2O, no soda (for over 2.5 years!) and blah. Any tips?? I figure I would share my nail mail that came in on Friday. I said I'm on a no-buy for January, and I still have been sticking with that! I ordered these in December, so it counts! If you 'like' me via facebook, you'll have seen this already, but, here ya go! Photo top left: my new Butter London babies: Shambolic, Jack The Lad, Scuppered, and Jaffa. Photo top right: close up for Shambolic, Jack The Lad, and Scuppered. Photo bottom right: I (heart) NP packaging. Photo bottom left: I thought Trout Pout & Jaffa were really similar when I first saw Jaffa irl, they aren't. This photo proves it. So cute! These colors are so fun together!